A postgraduate from Symbiosis Institute of Mass Communication in Pune India, she worked in the documentary and TV series world for 6 years. Specializing in wildlife and environment based scripts sh worked at Miditech Television on ‘Living on the Edge,’ and Riverbank Studios for 180 episodes on ‘Earth Matters’. As a scriptwriter and researcher she traveled extensively across India sourcing stories that highlighted the need for conservation and social issues. Her passion for conservation led her to action through wildlife education. For the past 14 years she has done teacher training workshops, children’s workshops, developed material for wildlife education and community outreach under the banner ‘Wild’. In 2003, she was selected as the first C.V Starr Fellow to undergo training in zoo education with the Wildlife Conservation Society in New York as part of the Teachers for Tigers Program run by Zoo Outreach Organisation. She was also an education consultant with the Madras Crocodile Bank. She is also a core team member of the LivelyWaters! Initiative. 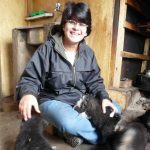 Some of her key projects are: Eco-clubs in four districts in Nagaland to wean children away from hunting into exploration and discovery with her ‘Under the Canopy’ manual with Dusty foot Productions and North East Network. Trainer for the Friends of the Amur Falcon Conservation Initiative for Nagaland Wildlife and Biodiversity Conservation Trust. Designer for interpretative boards for the Forest College, Gass Museum in Coimbatore with Pitchandikulam Forest Consultants.